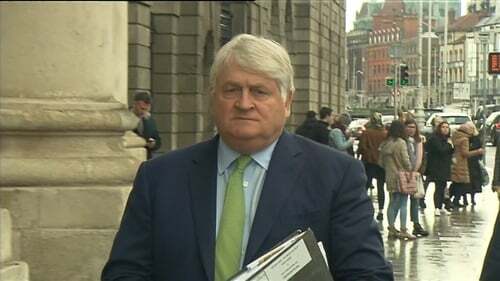 Businessman Denis O'Brien has denied to the High Court that he is "self-obsessed" in his view of articles published in the Sunday Business Post newspaper almost four years ago. Mr O'Brien is being cross-examined by lawyers for the newspaper in his defamation action against it. He told Senior Counsel Michael McDowell for the newspaper that the evidence was loud and clear - he was not a "developer king", and he did not "bust the country". Mr O'Brien is suing over articles published on 15 March 2015 giving details of a 2008 report by accountants PwC into Ireland's banks. Mr O'Brien says the articles portrayed him as one of the "developer kings" who destroyed the country and bankrupted its banking system. He claims he was "lumped in" with a "gang of 22" and portrayed as someone who over-borrowed in a disturbing way, received cheap and easy money from the banks and was facilitated by improper influence on bankers, politicians and civil servants. He says he was also portrayed as someone who had tried to keep his identity as a substantial borrower a secret. Under cross-examination from Mr McDowell, Mr O'Brien told the High Court he was a property investor and was a long way from being a developer king. He said it was grossly unfair to describe him as a developer. Mr O'Brien told Mr McDowell, he would need a Disney-like imagination to say that because he had various small investments he was one of the 22 people who unravelled the banks and was guilty of reckless borrowing. Mr McDowell asked Mr O'Brien to point out where the articles suggested that he personally was responsible for any wrongdoing. He quoted the Carly Simon song "You're so vain, you probably think this song is about you," and suggested it applied to Mr O'Brien who seemed to think people would believe everything in the articles referred to him. Mr O'Brien said he was not aware Mr McDowell was a music buff, to which Mr McDowell replied that he was a great fan of music station 98FM. Mr O'Brien said Mr McDowell was absolutely wrong to say there was no suggestion of any wrongdoing on his behalf. He said the articles were littered with allegations of wrongdoing on his behalf. In relation to a reference to the top five high risk borrowers, Mr McDowell suggested Mr O'Brien was self -obsessed and assumed that because he was so important people would believe the newspaper was referring to him. Mr O'Brien said he did not know how Mr McDowell could say that. Mr O'Brien said he was wrongly identified as someone who was struggling to pay interest on massive land banks. He said the articles did not differentiate between those who were struggling and those who were living up to their commitments. He said they were all lumped together in a "skip of defamatory allegations". Mr McDowell said the meaning of a subheading on the front page about "the files they did not want you to see" referred to the fact that the Government did not want the report to come into the public domain. He said the Government did not want the public to know they had been misled by the banks through PwC and the information the banks had given to PwC. He said after the reports appeared in the newspaper, the banking inquiry had contacted the journalist, Tom Lyons, asking for the PwC report. Mr O'Brien remarked that Mr Lyons was lucky that it was not the Director of Public Prosecutions who came looking for him as the report should never have been given to him. Put to him that it was PwC, in their report who listed the 22 names in the order they appeared in the newspaper, Mr O'Brien said he had never seen the report and it was a criminal report to have it. He said this was one of the reasons why someone in the Sunday Business Post had destroyed their copy of the report. Mr O'Brien said it was wrong to say he would have been under huge financial pressure if Anglo had gone bust in 2008. He said he would have paid back the money he owed. He said he could have written a cheque for the lot and was not in any way distressed. Mr O'Brien said the journalists who wrote the article could have rung him before publication and could have asked him if he was one of the people who bust the country. He claimed the editor of the newspaper must have been away that weekend. Mr O'Brien said voyeurism was alive and well in Ireland when it came to people's business interests and he claimed that was why he had been put on the front page of the newspaper. He said he had paid his interest every month, and paid off loans of more than €800m. He said he was not one of the people described in the articles. He said he brought back €600m and put it on deposit on two Irish banks because he had been asked to do so by AIB and Bank of Ireland, due to the flight of deposits from international companies. He said that was why he was "quite upset" that he had been defamed, all over the place in six pages. Mr O'Brien said there was a blasé attitude to people's banking confidentiality. The Sunday Business Post journalists got a report, illegally, breaking confidentiality of people's banking. He said his business was private, and if there was such a report he should have been told about it and it should have been sent to him. He said he did not think any information about banking affairs should have been put into the newspaper. Mr O'Brien said some of the information published by the newspaper about him was "factually incorrect". Mr McDowell put it to him that if information which had convinced the then-taoiseach that the banks were not bust in 2008, was in a report, then the public had a right to know it. Mr O'Brien said it was a private Cabinet paper, and it was illegal for the public to know what was in it. Mr O'Brien told Mr McDowell that as a former minister for justice, he knew full well what the word gang meant and that it was not excessive to say that it implied criminality and wrongdoing. He said it was not beyond Mr Lyons to have added him into the list of debtors to damage him. He said he had never seen the PWC report on which the articles were based. He said it was not for him to decide if Mr Lyons should have faced criminal sanctions for having the report. Mr O'Brien said if the editor of the paper or the then owner, Conor Killeen, had read the articles they would have said they should not have been published. He said Mr Killeen had written him a letter in which he said he had ultimate control of the newspaper. Under questioning from Mr McDowell and after an intervention from Mr Justice Bernard Barton, he said it was not true that as a general rule the editors of publications control editorial content and owners did not have any input into it. But he said he did not try to interfere with the editorial policies of INM or Newstalk. Mr O'Brien said the articles in the Sunday Business Post were souped up and senationalised and the journalists went out maliciously to defame him and do damage. He said he had not done anything about a previous article by Mr Lyons in the Sunday Independent, published by INM, which gave details of his Anglo Irish Bank borrowings. He said he was shocked that his banking relationships had been leaked. But he said the Sunday Independent had not described him in the same terms as the Sunday Business Post. Mr O'Brien said he had to live his life and he would only take action "when people absolutely abused" him. People write upsetting and untruthful things, he said but he could not spend his day writing letters to people when he was trying to run a business in every corner of the world. He said in 6,600 words there were only four lines about him being one of the banks' best customers. He said Mr Lyons had moved from one newspaper to another, brought his files, rewrote the story and turned it into something else. Mr O'Brien said he blamed 21 people for bringing down the country and stuck him in the middle of it. Asked again if he was suffering from the 'Carly Simon problem' and thinking the articles were all about him, Mr O'Brien told Mr McDowell, he was in second place to him in the vanity stakes.